Cannabis One has extensive experience operating in the most mature and competitive markets in the US. These markets over time have proven to be largely fragmented and saturated. Branding is the key to being successful within fragmented and saturated markets. The company has established itself as a “House of Brands” within the cannabis industry; acquiring a portfolio of top manufacturers and dispensaries in the most competitive states. In addition to their already established wholesale channels, CBIS will have 25 operating dispensaries under “The Joint” banner. This would put them in line with many other MSOs in terms of operating stores. The company currently does not have an East Coast footprint, providing an opportunity for significant catalysts in the coming months. 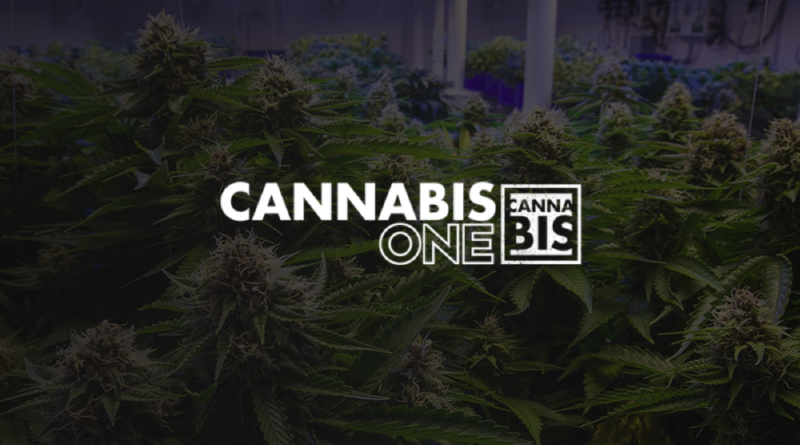 Cannabis One has conservatively estimated system wide revenue of US$116MM for 2019, and US$289MM for 2020, which puts them at under 2x sales prior to completing the acquisitions(3/31/2019). Overall, we believe that Cannabis One provides a different thesis for investors than the typical MSOs. They are rolling up proven manufacturers and dispensaries in the most competitive states with their eyes on acquisitions in other full recreational states over the oncoming quarters. Investment dollars within the cannabis industry has been rapidly changing direction. While the last several years has seen an influx of cash into Canadian operations as federal regulations evolved to that of a legal recreational market, this easy capital has started flowing in a different direction – to listed US operators. While the US promises to be the next big thing within the cannabis sector, there are some difference that currently exist. For instance, due to the current federal status of cannabis as a Schedule 1 drug, states have begun legalizing it themselves. This has resulted in a large disparity across the country in terms of the current state of the cannabis economy. Many states, such as New York, are just beginning to enter legal territory. Others, such as Colorado, have had medically and recreationally legal cannabis for a number of years, and thus the economy is much more advanced. Operating within these legal states thus is very different from one state to the next. While one state is treating cannabis as an emerging economy, others such as Colorado have already gone through the process of market fragmentation and saturation, thereby providing us insight into what it takes to be successful in this cut throat industry. Operationally Cannabis One is focused on becoming a vertically integrated entity within any state that it conducts business. This business practice is most prevalent in it’s home state of Colorado, wherein it has full integration from seed through to sale and everything in between. Here’s a state by state breakdown of the current market positions Cannabis One holds. Cultivation: Two facilities, the first of which opened in 2015. Collectively, the grow space encompasses 32,000 square feet foliage that is grown under the trademarked Cannabis brand of flower. Additionally, the company expects to add a third facility to its portfolio by year end. Processing & Manufacturing: Client facilities currently produce vape pens, concentrates, topicals, and edibles within the state under several brands the company owns or has long term agreements with. Cannabis One intends to complete the acquisition of two manufacturing facilities within FY19. Marketing & Distribution: Cannabis One owns the branding for The Joint, a top rated dispensary located within Denver. The company currently intends to add four more locations in the state in 2019. Processing & Manufacturing: Cannabis One is currently anticipating the finalization of an agreement for packing, sales, and distribution with an edible company located in Las Vegas. It is believed that this firm is Evergreen Organix, a premiere edible producer within the state that currently has market penetration rates of approximately 95%. Marketing & Distribution: The firm is currently working towards acquiring five retail clients (dispensaries) within the state by the end of FY19. Processing & Manufacturing: An award-winning product manufacturer has been awarded the contract to sell Cannabis One’s line of INDVR Fire products within the state. The products under this line focus on concentrates. It is believed that this is through Honu, a manufacturer located within the state that has ties to Evergreen Organix of Nevada. Marketing & Distribution: Much like Nevada, Cannabis One intends to have five retail clients within the state by the end of the fiscal year. It is unclear whether certain dispensaries have already been targeted for these planned expansions. Marketing & Distribution: On March 13 it was announced that Cannabis One had executed a letter of intent to acquire a majority interest in a dispensary within the Coachella Valley of California. The dispensary, to be rebanded under the “The Joint” banner, marks the first expansion of the brand within the state. Cannabis One intends to acquire four more locations within the state by the end of the fiscal year. One item to be considered, is the current legislative requirements for operating within the state of Colorado. With the current legislation in place, public companies are barred from owning operations in the cannabis industry. Instead, they are forced to utilize management agreements to comply with regulations. There is currently a bill, HB19-1090, that is going through the process of becoming law that effectively allows public companies to own cannabis operations within the state. The governor of the state has already acknowledged his approval for the bill, so its now a matter of going through the process. Upon the passage of this bill, Cannabis One will be able to directly own its operations within the state, rather than manage them through various agreements. Outside of these current operations, there are some other details to the planned expansion that Cannabis One has projected for. In addition to the above stated expansion plans, the company intends to acquire five retail clients within the state of Oregon by the end of the year, bringing the total to 25 by year end across all states. While this may seem ambitious, it is believed that the acquisitions will be in the form of the top performing dispensaries that sell Cannabis One’s branded products. By utilizing the data behind the sales of its branded products within the states of Colorado, Nevada, and Washington, the firm is able to easily identify top performers. It should also be stated that several of the brands that the company operates or has long-term contracts with are also present within the states of Oregon, California, Montana, and Arizona, from which Cannabis One can acquire the sales performance data. Key to the business strategy of Cannabis One is its “House of Brands” – premiere brands that are prevalent across many states that scream high quality product. While heavily focused on acquiring more brands for this purpose, the firm has already amassed a suite of brand names that clientele will already recognize for product quality. Presently, Cannabis One has four proprietary brands across its vertically integrated platform. The name under which Cannabis One operates its cultivation facilities. There are presently two locations that feature this brand name, both of which are located in Colorado. Within the listing statement, Cannabis One indicates that its clients currently cultivate over 40 flowers strains. It is believed that these are all under the Cannabis banner. Technically owned under the brand “Cannabis”, The Joint by Cannabis is the premiere dispensary brand that Cannabis One intends to utilize across its entire platform. Voted the best dispensary in Colorado by Leafly in 2018, the brand will soon be available in California as well, with further expansion to occur by the end of FY19. The focus of much of the companies manufacturing prowess, INDVR is the worlds first line of incognito vaporizing for discreet usage. Formats for these vaporizers include products that mimic the look of mascara tubes, lipstick, and that of a high end ballpoint pens. Similar to that of INDVR, this is a separate line of discreet vaporizers that is focused on being disposable. Through the use of acquisitions, Cannabis One intends to exploit underserved market opportunities and consumer segments in markets to maximize the “stickiness” that a brand has and the margin in which it provides. A premium player in the Nevada edibles market, Evergreen Organix operates a licensed cannabis production facility within the state. The team boasts experienced bakers, chocolatiers, and scientists to produce the highest quality product available on the market. In addition to Nevada, the firm also has sales within the states of Washington, Colorado, Montana, California, and Arizona. Based in Washington, Honu holds a processor license for the manufacturing of cannabis products. It’s portfolio boasts concentrates, edibles, topicals, and dried flower. In addition to the above, there are others for which Cannabis One has partnered with including but not limited to Zoots Premium Cannabis Infusions, Myaderm, Medamints Cannabis Mints, Cheech’s Private Stash, and more. Previously Founded and acted as CEO of Meridian Capital Advisors, a Registered Investment Advisory firm; Previously Managing Partner for Bertram Global Commodities Fund; Managed in excess of $100MM in assets for Merrill Lynch, Morgan Stanley, and Smith Barney private clients. Extensive experience in financial accounting and capital markets advisory, previously specializing in M&A and securities law in the U.S. and Canada; Held executive and general counsel roles with companies operating in the energy and real estate sectors in Canada; Currently Managing Director of Merchant Banking with Wildhorse Capital Partners. Founded Axis Venture Group in 2007 and MOXIE Productions in 2016; Has been involved in a variety of business ventures including business development, real estate development, and angel investing; An anesthesiologist with more than 20 years’ experience in the medical field, specializing in regenerative medicine. Oversees all investment and operational activates of retail and dispensary locations; Previously an active owner and operator of 45 restaurants across 7 national and regional franchise brands; Served on the Colorado Subway advertising board and has done business consulting for smaller regional franchise brands. Co-Founder & General Partner of Wildhorse Capital Partners; Previously Vice-President, Business Development at Blackbird Energy; Held several ascending roles as an investment banker at Stifel Nicolaus; Over $3 billion in capital raising deal experience. Co-Founder & General Partner of Wildhorse Capital Partners; Previously Senior Vice-President of Business Development & Operations for GABY; Board member for Subway Developments 2000; Acted as Managing Director of Oliver Capital Partners; Former Investment Banking Analyst at Ubequity Capital Partners. Led the design and development of Cannabis One’s INDVR vaporizer lines and is actively involved in brand acquisition & development. Previously owner and co-founder of Lexa Custom Homes, having home designs featured in the Colorado Parade of Homes and the Colorado Tour of Homes. In addition to the past competencies of Cannabis One’s management team, their current ownership should be noted as well. It should also be identified that a number of these shares are subject to lock up provisions, which we will cover more in depth below. As it stands, members of management own both portions of the subordinate voting shares, as well as that of Class B shares. In terms of equivalent Class A shares, the team owns just under 30% of the total shares on a fully diluted basis, signifying the success they intend to bring to the company. 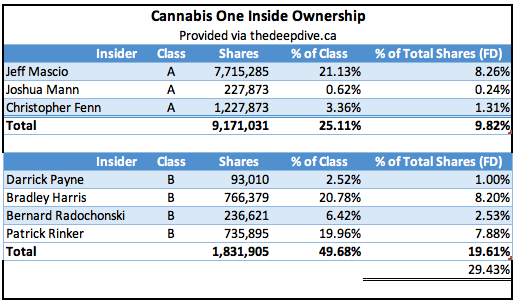 The share structure of Cannabis One Holdings is similar to that of many multi state operators that are currently trading on the Canadian junior markets. Similar, in that it has two classes of shares – A and B – that hold voting rights. Class B shares, owned by company insiders, represent ten Class A shares per share held, and can be converted at the holders discretion. Class A subordinate voting shares are what currently trade on public markets. Unlike most public multi state operators however, Cannabis One refers to these shares frequently in terms of “Class A equivalents” so as to keep investors in the loop of just how many shares are actually outstanding. In total, total votes between Class A and Class B shares are relatively on par. 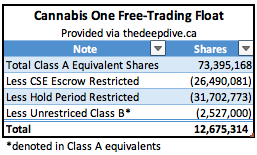 At full dilution, Cannabis One Holdings has approximately 93,409,241 shares outstanding – which is very small relative to many competitors within the market. That number shrinks down even more when examining the shares that are currently outstanding – a meager 73,395,168 shares are currently out when Class B equivalents are taken into consideration. However, where the true magic lies is within the share lockups. There are a number of securities that are currently restricted as a result of both CSE escrow restrictions, as well as that of hold period restrictions. To top it off, there’s also a portion of unrestricted Class B shares that exist, however due to their class status (i.e. they are not Class A) they are not available for trade on the open markets. In total, there’s only 12,675,314 shares free trading on the market at the time of writing. FULL DISCLOSURE: Cannabis One Holdings is a client of Canacom Group, the parent company of The Deep Dive. The author has been paid for this work and may or may not own shares of the company. Not a recommendation to buy or sell. Always do additional research and consult a professional before purchasing a security.